"Good teachers make good students, so thank you all for all your hard work, patience and guidance in helping Aarin achieve the goals you set for him. I can't tell you how blessed we feel that he has the opportunity to learn from such amazing teachers." "Luke bounced into the car at pickup and the very first thing he had to tell me was that he scored a 102 on his math test! He was so pumped up and excited and proud of that grade! Thank you to both of you for your willingness to work with us to help Luke. It is paying off!" "Will got a 94 on his math final and pulled a B for the course. We are thrilled! Thank you for the help!" "Woo!! Thank you guys so much!! I knew if anyone could help her understand the material, it would be you all. Thank you so much for working with her!" "She got a 96 [on her final]! Yea! Thanks to you and all your instructors for their help!" "I just wanted to take this opportunity to thank you for helping my son. Thanks to Mathnasium my son will be able to go to 3rd grade. I will be back next year. Have a great summer break! Thank you very much." Rachel D. is a 15 year old rising sophomore at Hillside High School where she took geometry her freshmen year of high school. During her geometry course, Rachel joined Mathnasium in Brier Creek last fall of 2009. Because of joining Mathnasium; Rachel received a 90% on her Geometry EOC. Rachel says, 'Before joining Mathnasium, I was excellent at memorizing and doing geometry. During Mathnasium, I was excellent at understanding geometry.' Rachel now will be continuing her tutoring at Mathnasium for Algebra 2. 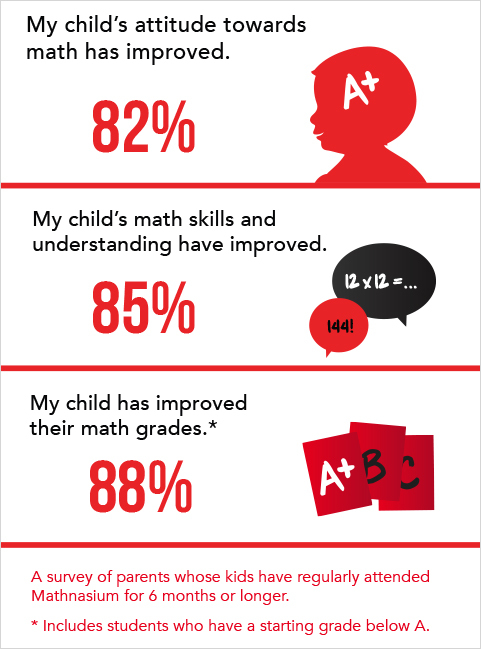 "Mathnasium has been an excellent resource for my three children. Whether it was for tutoring, enrichment or preparing them for the E.O.G.s, Mathnasium has made learning easy and fun for them. I saw my children excel, gain confidence and they loved watching their own grades "soar." Denise and the other instructors care about the children and help formulate a plan so that every child can succeed. I am grateful for everything Mathnasium has done for my children and always recommend it to everyone whether it is for helping a child who is behind, or just keeping them way ahead and challenged!" ? "Hi Denise, I hope you and the family are all healthy and happy! I'm so happy to tell you that Ian received a 4 on his math EOG. We are so HAPPY!! THANKS FOR THE WONDERFUL MATHNASIUM PROGRAM! Thank you for all you do! Hope to see you soon"
"Hi Rebecca, I have been meaning to email you. By the way Lauren passed her EOG with a high 3, I am so thankful to you and your staff for the wonderful teaching you guys have done! One millions thanks, you guys are wonderful! I want to thank you again for all of your help. You made it so easy for us to make the decision and Lauren did so well on her EOG's thanks to you guys. I can't say enough Thank U's." "Hi, Thanks so much for all you have done. Math is the only class he has a solid A in thanks to you. Thanks again"
"Hello Rebecca, .... Timia will return in August when the school year starts again. It has been a really great experience and she is so much more confident about her ability to do math. Thanks for everything." "Rebecca, Austin made a 4 on his EOG! He missed 3 questions. Thank you, Thank you, Thank you! I'm planning on signing him up for the year again. Thanks again,"
"Andrew earned 4s on his EOGs. We credit Mathnasium for helping him cruise through math this year. Thank you!" "Several years ago my daughter began taking classes at Mathnasium. Not because she was deficient in math but because she loved math. The instructors have been wonderful over the years and we could not be happier with Avery's progress. How do we say thank you for what you have given us? How do we show our appreciation for the help you have given us on our journey with one of our children, our most precious gifts. This is without a doubt the bet decision I have ever made and would be a bargain at 4 or 5 times the price. I have attached a letter from our school about Avery competing on a Geometry team for her Middle School. Geometry as an eighth grader and on a competing team, WOW! Thank you Denise and the entire staff at Mathnasium at Brier Creek. You are making differences in kids lives!" "I wanted to thank you and Mathnasium for your program and the support my son received from you, Devore, Dimitri, Emma and the other instructors that tutored Seth from November 2011 - May 2012." "As a result of Mathnasium's tutoring help, my son went from an F in November on his interim to receiving the highest score (100) on the Algebra I mid-term in his school and finished the 2nd Quarter and 1st Semester with a grade of B. In the second semester, with my son's new found confidence in Algebra I and with Mathnasium's tutoring support twice a week - , my son received a B in Algebra I in the 3rd quarter and started preparing for the End of Year Math exam and End of Course Algebra I exam." 1) He received for the End of Grade exam a Scale Score of 377 and Percentile Rank of 97% (Level 4). 2) He received the Excellence in Math Award for the 4th quarter in his Algebra I class. He also received a Level 4 grade on his End of Course exam and finished the year with an "A" in the 4th quarter, an "A" for the 2nd semester, and an "A" for the Final Algebra I math grade. The End of Grade exam's statement read - "Students performing at this level consistently perform in a superior manner clearly beyond that required to be proficient at grade level work!" Thank you for your program, your teachers, and for giving him the skills and confidence to be able to persevere and excel in Algebra! I would highly recommend Mathnasium to any student struggling in Math, or wanting to brush up on their skills, or wanting to adequately prepare for exams! I would like to express my sincere gratitude to Ms. DaVore and the staff at Brier Creek Mathnasium for all the efforts they made teaching my 11 year old son this summer. I am a firm believer in the important role that educators play in the life of children and Ms.DaVore exemplifies all the best qualities that a parent could hope for in this influential position. What I observed is that she has managed to create a most positive learning environment wherein the children are not only learning, but happy to be there as well! We live overseas but spend our summers here in Raleigh with family. My son told me he wished we lived here always so that he could come to Mathnasium with Ms.DaVore! Visit mathnasium.com/videotestimonials.html to see testimonials from students and teachers.